The Fokker 100 is a medium size twin-turbofan airliner from the Fokker company. Low operational costs and almost no competition in the 100-seat short-range class made it a best seller when it was introduced in the late 1980s, but improved models of the Bombardier CRJ200 and Embraer ERJ 145 family affected sales and Fokker became insolvent. Production ended in 1997 with 283 airframes delivered. In August 2006, 229 Fokker 100 aircraft remained in airline service with 47 airlines around the world. The Fokker F28 Mk 0100 program was announced in 1983 as an updated replacement for Fokker's popular, but superseded F28 Fellowship design. Marketed as the Fokker 1000 the design was based on the original F28 but features modern avionics, new generation Rolls-Royce Tay turbofan engines and a redesigned wing. However the most noticeable difference was the longer fuselage, which increased seating by 65% from 65 in the original F28 series to a maximum of 107 in a three-by-two single-class arrangement. The new wing is claimed by Fokker to be 30% more efficient in cruise, while still keeping the simplicy of a fixed leading edge. The cockpit was updated with a Rockwell Collins DU-1000 EFIS. Like the Fokker Fellowship, The Fokker 100 features twin rear fuselage-mounted engines and a T-tail, similar to that of the Douglas DC-9 family. The Fokker 100 does not have eyebrow windows above the main cockpit windows as on the Fokker F28. Two prototypes were built - the first, PH-MKH, flew for the first time on November 30, 1986, and the second, PH-MKC, followed on February 25, 1987. The type certificate was awarded in November 1987. The first deliveries of the TAY620-15 powered versions started to Swissair in February 1988. American Airlines (75 planes ordered), TAM Transportes A�reos Regionais (now TAM Airlines (TAM Linhas A�reas)) (50 planes) and US Air (40 planes) were major customers of the Fokker 100 and were powered by the more powerful TAY650-15. By 1991, Fokker had produced 70 units and had orders for more than 230. An extended range version with additional fuel tanks in the wings was introduced in 1993, and a quick-change passenger/freighter version in 1994, the 100QC. A shorter version was introduced in 1993 as a replacement for the earlier F28, known as the Fokker 70, which removed 4.70 m (15.42 ft) of the fuselage and reduced seating to 80. Studies on the 130 seat Fokker 130 and the Fokker 100QC (freighter) did not reach further stages of development. A Fokker 100EJ (Executive Jet) was introduced in 2003 as a conversion from used Fokker 100 aircraft. Although the design was a success in the marketplace, Fokker continued to lose money due to mismanagement. Eventually their parent company, Daimler Benz Aerospace, shut them down. Fokker collapsed in 1996 and wound up production in early 1997. There had been some discussion about the company being purchased by Bombardier, but the plans fell through. 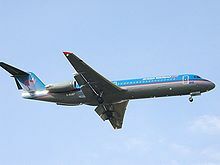 An Amsterdam-based group, Rekkof Restart (Rekkof is Fokker spelled backwards) negotiated to re-open the Fokker 70 and 100 lines in 1999, but the deal never completed. Stork B.V. acquired the maintenance business for the aircraft and operated it under the name "Fokker Aviation". Like any number of designs, the 70/100 was being increasingly squeezed from below by stretched versions of the Bombardier and Embraer regional jets, which also killed off plans for the Fairchild 728JET/928JET and an unnamed design from ATR. A proposed stretch version called the Fokker 130 was never built. As of August 2009, 229 aircraft are still in operational use with airlines. Picture - An Air Niugini Fokker 100 (P2-ANH) parked at Mt. Hagen's Kagamuga Airport, Papua New Guinea. On March 5, 1993 Palair Macedonian Flight 301, a Fokker 100 (PH-KXL) crashed shortly after take-off from Skopje Airport on its way to Zurich Airport, killing 83 of 97 passengers and crew on board. On October 31, 1996, TAM Transportes A�reos Regionais Flight 402 crashed next to Congonhas Airport in Brazil, killing 99 people, including everyone on board plus 4 people on the ground. On November 7, 1999 Air Dolomiti Flight 2708, a Fokker 100 flying from Venice Marco Polo Airport with 44 on board, suffered maingear failure while approaching Barcelona International Airport and landed safely on a foam carpet. On January 25, 2007, Air France Flight 7775 from Pau to Paris crashed shortly after take-off. All 54 passengers and crew escaped from the aircraft, although one person was killed on the ground. An investigation by the BEA revealed that the cause of the accident was ice on the wings of the aircraft involved. On February 2, 2008, an Austrian Airlines Fokker 100 made an emergency landing at Leeds Bradford International Airport in the UK, after the right engine was reported idle. The pilots landed safely, and there were no injuries amongst the 103 passengers and crew on board. On September 14, 2009, Contact Air Flight 288 from Berlin Tegel was forced to make an emergency landing at Stuttgart Airport, Germany. None of the passengers, including well-known German politician Franz Mx�ntefering, were seriously injured. On 18 November 2009, Iran Air Fokker 100 EP-CFO suffered an undercarriage malfunction on take-off from Isfahan International Airport. The aircraft was on a flight to Mehrabad Airport, Tehran when the undercarriage failed to retract. The aircraft landed at Isfahan but was substantially damaged when the left main gear collapsed. On 3 December 2009, Merpati Nusantara Airlines Fokker 100 PK-MJD made an emergency landing at El Tari Airport, Kupang when the left main gear failed to extend. There were no injuries among the passengers and crew. On 15 January 2010, Iran Air Fokker 100 EP-IDA, operating Flight 223 was substantially damaged when the nose gear collapsed after landing at Isfahan International Airport. On 11 February 2010, Click Mexicana Fokker 100 XA-SHJ, operating flight CBE7222 was forced to land on its belly due to a presumably a mechanical failure on the landing gear; it was routed to make an emergency landing at Aeropuerto Internacional de Monterrey where the aircraft overran the runway. None of the passengers were seriously injured. On August 25 2010, Iran Aseman Airlines Flight 773, operated by a Fokker 100, overran the runway on landing at Tabriz International Airport because of bad runway conditions (water puddles). The aircraft was substantially damaged.